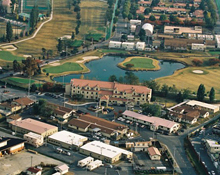 USAG Daegu is home to Camps Henry, Walker, George and Carroll. A free shuttle links these posts. The city of Daegu is the third largest city in Korea with a population of 2.5 million. It is located approximately 200 miles south of Seoul. It is famous for deliciously crunchy and juicy apples and the textile industries that produce fabrics mainly for export.